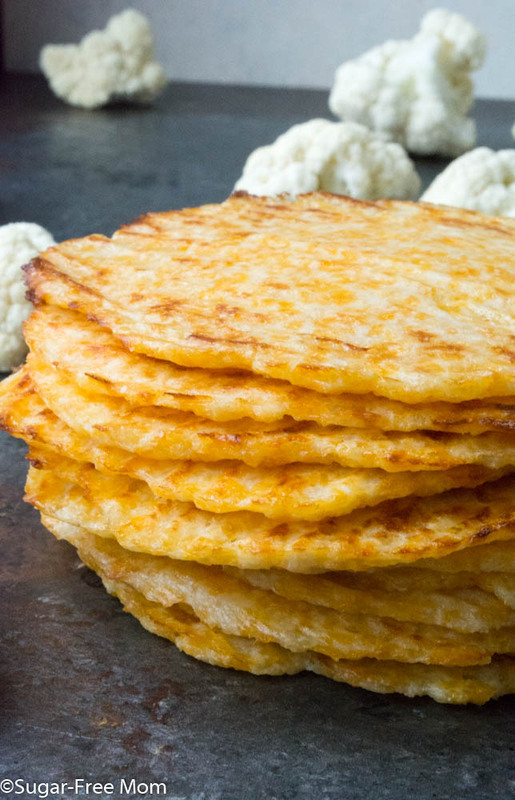 Just a few ingredients are needed to make these fabulous tortillas. They are baked in the oven so NO Flipping required, making these the easiest tortillas you have ever made! It’s Monday and January 2nd so that can only mean one thing………The diet starts now! 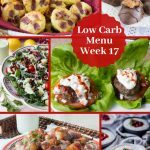 Maybe not, if you’ve been faithfully enjoying a low carb and sugar free life style for some time now. 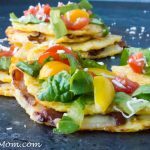 Even if you’ve been really balanced through the holidays, (I for one overindulged and need to watch my portions more than ever), these tortillas are great for a healthy lunch or dinner recipe. I don’t know about you, but I hardly make New Year’s Resolutions. I’d rather focus on a few things that are doable with small goals I can actually and realistically do during the hectic week with my family. I’m a busy mom of 3 kids and I homeschool and I run this blog and it’s not easy working from home with constant interruptions. BUT I am grateful for being able to BE at home, do something I love as a career and teach my kids. Honestly though, my time is truly limited and I’ve had to find ways to get in exercise and work before school begins. I’ve had to become a morning person and get up at 5:15am every day! It’s tough but it really is the only way for me to make time for myself. My focus this year in my life is to get strong and fit through increasing my cardio, but adding twice a week of strength and weight training. I tend to get back spasms and all the cardio in the world won’t help my back if my core isn’t strong so that’s my focus this year. Over our school vacation I had a cauliflower in the fridge I wanted to use up. 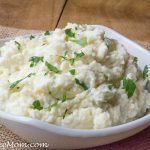 I’ve got a ton of hidden cauliflower recipes and knew I wanted to do something a bit different with this one. I looked over my cauliflower tots which my family loves and adapted from there. To be completely honest with you I was hoping to make a new chip, but the recipe didn’t work as I thought and now we’ve got these awesome tortillas instead, still a win in my book! My oldest teen loved them and didn’t even realize cauliflower was in there! You’re family will hardly believe these tortillas contain cauliflower, if they passed my picky teen son test! The reason I didn’t just use an egg here and chose egg whites instead is that I didn’t want them any more yellowy in color. Yolks often provide the fat content to most recipes and since I am using a lot of cheese which has fat, the yolk isn’t needed. The egg whites are enough to bind the ingredients together. If you prefer you could replace the egg whites with one egg. PLEASE!!!! Weigh these measurements! A cup of shredded cheese is not the same as weighing it in ounces. If you notice them to be a bit greasy, simply pat them with a paper towel. If you buy all ready riced cauliflower, use 2 1/2 cups, that’s how much mine measured after I grated it in my food processor. UPDATE: I decided to make these again using 1 egg instead of egg whites to make it easier for everyone. I also felt since they were a bit greasy I weighed my cheese and was now only able to make 12 instead of 16. I also spread them out even flatter, about 1/8 inch thick and they are amazing! Lay parchment paper on two baking sheets. Set aside. Place the florets into a food processor and pulse until the florets are grated and there are no large pieces. Add into the food processor the remaining ingredients and pulse until combined. Scoop 3 tablespoons of the mixture onto the baking sheet and pat down into an even flat, round circle about 1/4 inch or even 1/8 inch thick depending on your preference. Do this with the remaining batter. I made 16. To get some color on the other side of the tortillas you can place another piece of parchment over the cooked tortillas. Then place another baking pan the same size over the parchment. Holding the sides of the pans together, flip the pan over and remove the layer of parchment. You can then place them back in the oven for another 5 minutes if you prefer. Allow to cool then layer between pieces of paper towel to absorb some of the grease from the cheese. Fill as you would for a taco. Keep remaining pieces in the refrigerator until ready to use again. Hello! I would love to try this. I live in Dublin and wondering what to use instead of mexican cheese? 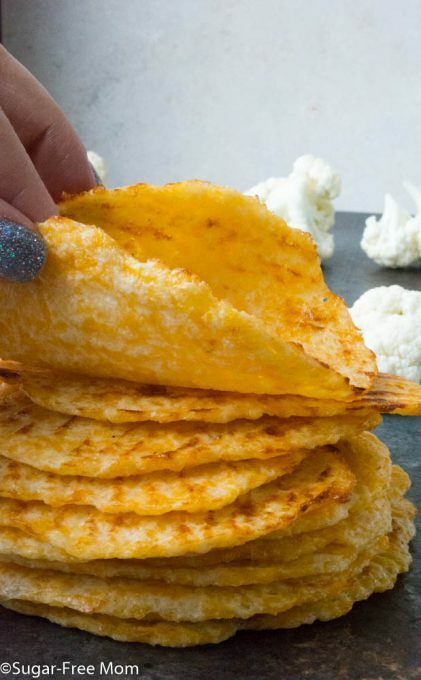 Any cheese you can easily shred or grate, preferably cheddar cheese, but mozzarella may work too. I dont have a food processor, only a blender will that work??? You really need to cauliflower grated so if you can do that in the blender without making it turn into a mashed cauliflower you should be good. I used Mozzarella an they came out great. used them to make a lasasgna. It was delicious! I LIKE that idea, Patti!! I’ve used zucchini, both rounds and long slices, for lasagna, and that’s good. But I really like the idea of making a sort of long “noodle” out of this to use in place of the pasta noodles. You mention using mozzarella. Do you add some Italian seasonings along with the salt and garlic? Also, do you get a lot of liquid coming from your cauliflower? 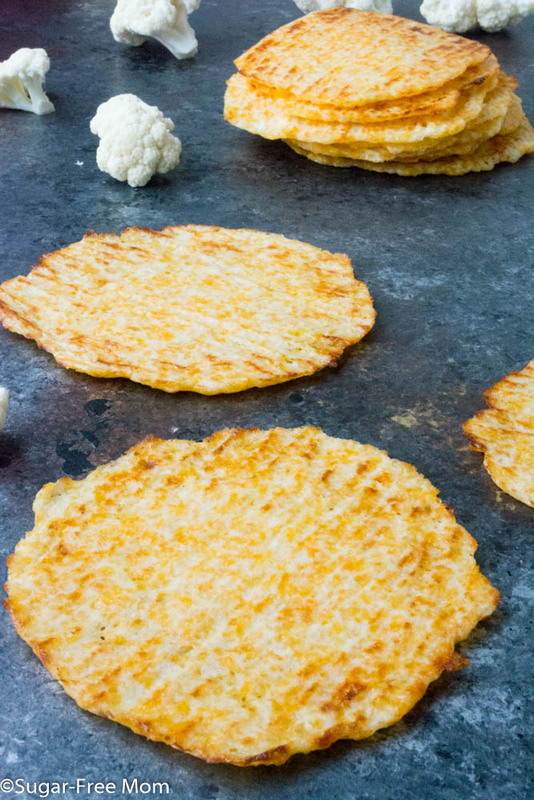 When I make cauliflower into “latkes”, I usually grate it and microwave it, then squeeze a bunch of the water out of it before mixing it with egg, a little parm, and some salt/pepper/onion/garlic/cajun seasoning. Just wondered, as soupy lasagna can be a little disappointing. 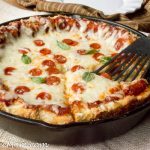 Hi, i make them with parmesan chees – works really well!! Mexican cheese is considered a bland easy melting cheese, so a softer white cheddar would be good. Mix a little feta in with it to give it a little saltiness. Not much. Mixed, white and yellow cheddar works well also. Do you suppose they could be used for a pizza ? I don’t think they would be sturdy enough to hold and add toppings to, unless maybe adding some flour to this. Do you think instead of the oven they could be made in a oiled cast iron pan or a heavy frying pan ? You could probably do that, may be difficult to flip but worth a try. This looks amazing! I think it happening today! Hello,Can you freeze these? These tortillas sound really good,I would like to make several of them. I haven’t tried yet, they were left in the fridge and eaten within a day in my house. My son is dairy free and I wondering if dairy free cheese could be a substitute for the regular cheese. Or something else instead of cheese. Same here. I’m lactose intolerant and I wonder if these will still hold together without cheese? I am also lactose intolerant and finally found a cheese I can eat! Boar’s Head Vermont Cheddar is lactose free. I buy the white in packages in specialty cheese round by the deli or the typical orange cheddar in the deli case and have it sliced. We also found lactose free Boar’s Head Gouda.. —-Read the labels —- because not all of their cheeses are lactose free even within a type. I will be using this type cheese for these tortillas! Can’t wait! Instead of the flipping to brown the other side, could you place the cooked tortillas under the broiler? Watch them really closely, leave just for a minute. Made these last night, to rave reviews! I am a Type 1 diabetic who is always looking for healthy alternatives. We did a fish taco bar, with salmon, shrimp and haddock. I subbed in about 1/3 cup Parmesan cheese and used a bit less cheese overall, maybe 1.5 cups. They rocked and folded up beautifully. 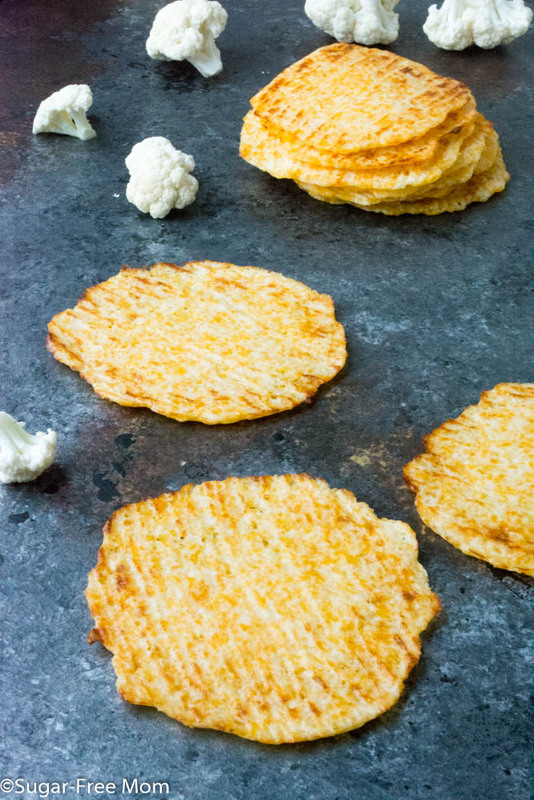 Wait….you’re telling me you made these with RAW riced cauliflower? No steaming and squeezing madness? I’m in awe…..
Me too!!!! That’s the worst part about working with cauliflower. Thank you!!!!! I buy the already riced cauliflower. How many cups would you say the recipe is already riced? I know that 4 cups florets probably not equal to 4 cups already riced? I’m super excited to try these! I measured it out after I grated/riced it in the food processor, it was 2 1/2 cups. I haven’t tried it but if you do please come back to let me know if it worked. It’s really just to bind the ingredients so I do think it might work. Is it 4 cups of florets AND 1/2 head or either? No, the head of cauliflower I had was about 8 cups florets, if you wanted to double everything for the recipe you could do that and get 24 instead of 12. I tested the recipe just using half the head of cauliflower, so 4 cups was what it was. The 8 cups is after or before processed. Not sure where you’re getting 8 cups from. It’s 4 cups or 12 ounces prior to processing. Brenda, you are a genius! These are amazing. I live in Southern California, surrounded by Mexican food, and I really miss tacos. They taste sooo good and they were very easy to make. I used frozen cauliflower rice and it worked beautifully. 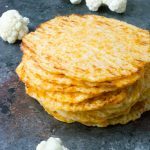 I want the recipe for the cauliflower tortillas but cannot seem to find it. hmmm well this is the page, it’s at the bottom, not sure why you aren’t seeing it. A mix of different cheeses like cheddar, asiago. Any shredded cheese will work. Hey Brenda, I’m Sandra from germany and I want to say, I realy love your recepies! germany. I look forwald to here from you thank you so much! How long do you think they would last in the fridge ? I think they’d be good for at least 5 days. Curios if there s substitute for the cheese. Was all excited when I first saw the recipe but can’t have cheese. I’m sorry I’ve not made subs for the cheese. Mine stuck badly to the parchment paper, did you spray it with oil or anything? No I didn’t spray the parchment. Make sure you use full fat cheese. Mine did too. I was do disappointed. I really wanted these. Did you try again? omg so excited to try these! thank yoU! have you ever worked with oat fiber? I wonder If I can add some here to stretch the batter a bit in order to make more? Do you think i would be able to freeze them? I’ve only kept them refrigerated but I do think if separated between parchment and stored well in an airtight container in the freezer then thawed the night before would be fine. Hi, It helps to freeze them on a tray and then store them with parchment paper after they are frozen. Works better than trying to freeze them with the parchment paper between them. Then just thaw them as you need. How long would it bake this for and what are the instructions do I cook the coliflower then blend it all together? The instructions are in the recipe, it does not say to cook the cauliflower. Follow the written instructions. Just made these….WOW! Great taste, texture. I ov9e them! Thank you for the recipe. For a football party in the fall I made it with cheese and toppings like a pizza. I also recently made them without cheese. I used them a hamburger ” bun” with salsa last week. And then ate them topped with meatloaf and mushrooms this week. I look forward to making individual one, thin and trying the parchment paper and pan on top. Awesome ideas! Glad you liked them! 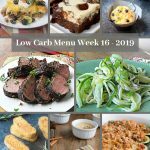 I have really been enjoying your recipes! Thank you so much for sharing 🙂 I am also a homeschool mom of 3. I can’t wait to try these tortillas! I have a tortilla press that i use to make my corn tortillas on. I just use 2 very thin pieces of clear plastic so i am going to try using it to make these. It might make my job a little easier. I have arthritis in both hands and i use the lower part of my elbow to press my tortillas and it works. I’ll keep you up to date once i try it out. Although, i can’t wait to try them out. Please let me know, maybe I need to buy a press! I haven’t frozen them but I think if you lay a piece of parchment between each one then freeze they should separate better. The flavor on these are great! They didn’t hold together as taco shells unfortunately (not sure what I did wrong – cauliflower had too much moisture? Fresh shredded cheese instead of bagged? ), but my kids are enjoying eating them plain and as quesadillas! That will be a big help when I transition them to grain free in a few weeks. 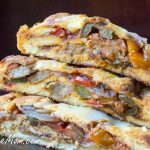 I can see these tortillas working out well for Mexican lasagna or enchilada casserole, things that don’t have to hold together. Anything that gets my picky littles happily eating veggies is a winner in my book! Thank you!! Was wondering if person could fry them rather than bake them? Thoughts? My oven is a pain to use. I think so but you would have to use two spatulas to flip, they are flimsy and difficult to flip. Is it possible to use frozen, well thawed, drained cauliflower? I can certainly squeeze it out a bit if necessary. 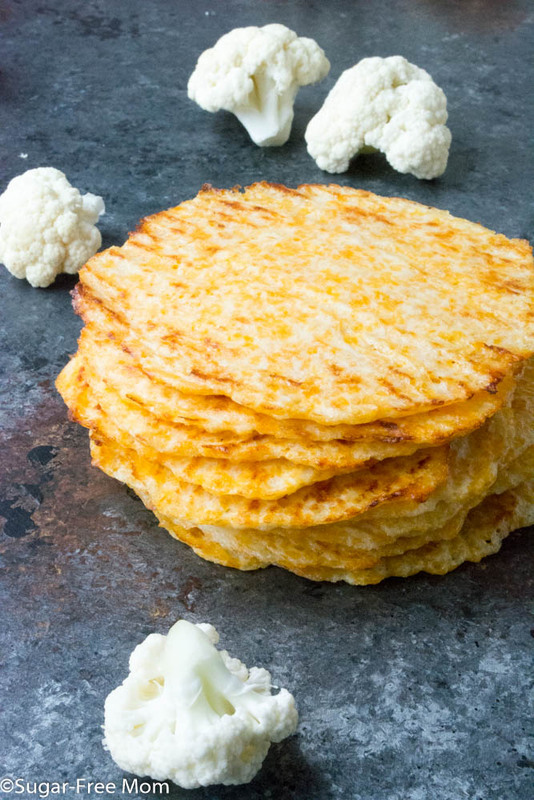 There’s a shortage of cauliflower at my local store and I REALLY wish to make these soon so I’m willing to improvise. not sure, don’t have one, let me know if you try it. These turned out great! I cooked half and saved the other half to make some for lunches. We had pulled pork tacos, they were delicious! I made these 1/4 inch thick last time and although they were nice, I am making them tonight 1/8 inch thick to see if I can get them crisper. Looking forward to having them with a Moroccan Stew tonight! Yum! I made these 1/8 inch thick (by putting baking paper over them and flattening them thinly with the palm of my hands) and they were very nice, my husband loved them. They would make really nice crisp crackers if made smaller. I think I prefer them a bit thicker as tortillas. But all in all they are really good. Can I have the recipe for the taco filling you have in the picture with the cauliflower taco shells. I let them cool a bit before removing them, they came out easily once cooled. I made a double batch, I didn’t want a problem with sticking so I used about a tablespoon of avocado oil on the parchment paper then patted them out. I also set my oven for convection and to my surprise the bottoms browned as much as the top, no need to flip and turn and re-bake or put in the broiler! What are the other ingredients in the tacos? Do you recommend an egg substitute? I’ve not really used any, but I know many have often tried using chia or flax as an egg replacer in my recipes. 1 tortilla it should be not 1 gram, I just switched my recipe plug in and it’s gone a little funky. How much cheese ? Recipe says 2.25 cups 8.5ounces. ? I measured the cheese in cups then put it on my scale and weight is shown in recipe in ounces and grams. So these are amazing. Hands down. I made them with a mature english cheddar and I think next time I’ll mix it with something a little bit more fatty because I had trouble treading the line between being over-done and sticking to the parchment paper. But even the failures tasted amazing so no one complained. DO you feel confident that someone who does not eat cauliflower would not know these are made from it? I don’t really like very many vegetables, but am willing to try if they taste like a tortilla. My teen hates cauli and ate these. Sorry I’ve not attempted it so not sure. I finally got around to try making these, I made pulled pork enchiladas. They were amazing. I used the frozen cauliflower rice, which my husband saw me put in the grocery basket. Neither one of us likes veggies, so we were skeptical. These tortillas were great in the enchiladas, I think they are a little too flimsy for tacos, they were perfect for enchiladas. Good stuff and clear directions on the recipe. First of all, let me say that I loved these tortillas. I was actually surprised at how little the taste of the cauliflower comes through. Don’t get me wrong- I love cauliflower, but I didn’t want this to be a cauliflower dish. I liked that I didn’t have to pre-cook and strain the cauliflower. To rice mine, I used my quick pull food chopper (https://goo.gl/CB7d36 Best food chopping device I have ever used!). What I am confused by is that you were able to get 16 tortillas. I was only able to get 6 that were about the size of a street taco. I made them about 1/4 inch thick. How did you get so many? What circumference are yours? 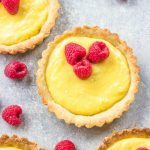 ⭐️⭐️⭐️⭐️⭐️This recipe was a game changer in my keto/paleo House!! Thank you so much for sharing!! 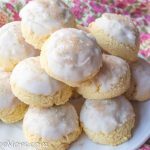 Going to make these right now– I ended up with 4 lbs of cauliflower pearls in the refrigerator (bought twice by mistake). I already made latkes so now I’ll use up the rest for theses. When you say Mexican cheese so you mean a cheddar Mexican blend (like pre-packaged stuff in stores) or do you mean Queso Fresco. From reading the responses it looks like lots of cheeses will work with the recipe, I am just wondering the cheese you used. 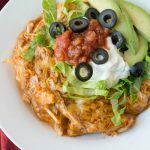 I was thinking a shredded Mexican blend that has a variety of cheeses in it but yes most cheeses will work in this recipe. i didn’t notice if anyone had asked or not, but can these be stored for later or do they need to be eaten immediately? Definitely can be stored in the fridge, covered well with plastic wrap to keep them from drying out. Love these. Not an obvious cauliflower flavor. A little fragile but held together well enough. I might try some different cheese combos in the future, maybe a bit of Parmesan. Thanks for the recipe. Do you have any tortilla recipes or other products that can be made for a person with chronic kidney disease. 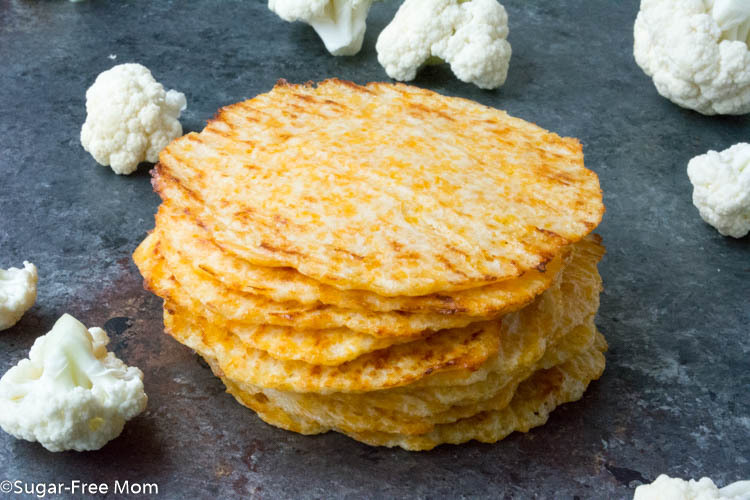 Low potassium,low sodium,low phosphorous.can something be sustituted for cheese in your low carb cauliflower tortillas.They sound soo good. Sorry I’ve not tried any sub for the cheese in these tortillas. I’ve been testing and testing but sadly have not perfected a dairy free tortilla, yet!! I’m going to keep trying though! 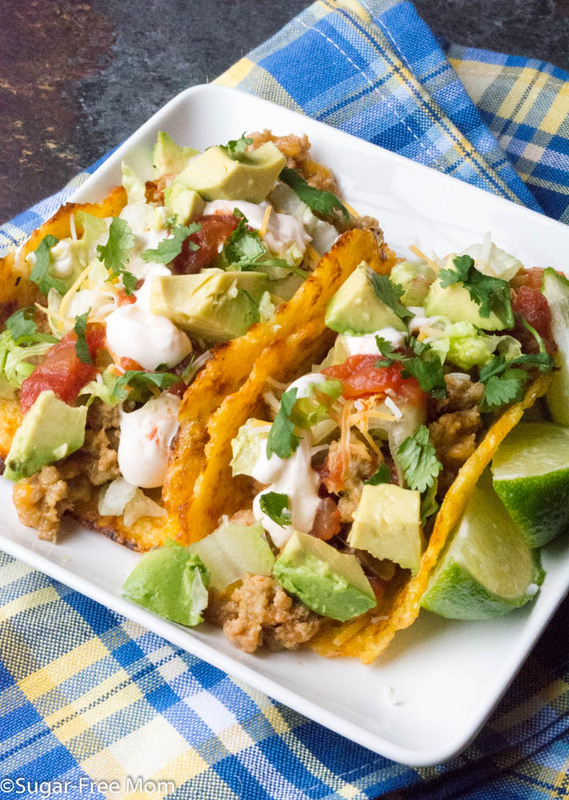 Do you have the recipe for the taco filling you have in the picture with the cauliflower taco shells anywhere on your site? I have tried a few search combinations but have come up short. It would be appreciated! No actually I don’t sorry about that! Can these be made without the cheese? You’d need to replace it with something else and I’ve not tried subbing the cheese for anything else sorry. 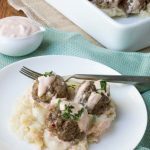 If I am using Frozen riced cauliflower, how would I do that? Thaw the cauliflower then get all the moisture out? Thanks! Under my notes I mentioned just use 2 1/2 cup if it’s already riced, then just follow the recipe. I didn’t cook it or squeeze the cauliflower, there’s no need in this recipe that’s the joy of it. Mine was a combination of mild cheddar, Asadero, Queso quesadilla, and Monetery Jack. Hello! Can you please just sale these? Was skeptical about these but made them for tacos and they turned out GREAT! I even pulled out the regular flour tortillas thinking my boyfriend would turn his nose up at these, but he loved them and ate only them! Definitely will be making these all the time. My only question- is the cheese necessary? They were delicious with it but I can’t see them tasting bad without (just trying to make it even healthier), just wonder if the cheese helps hold them together or anything. TIA and thanks for this delicious recipe!! Hi Kelsey, that’s awesome your boyfriend surprised you! I’ve not attempted to remove the cheese and I do feel it binds the cauliflower better. Maybe try adding something to replace the cheese, a little almond or coconut flour. Sorry I can be more helpful, I just love cheese! Hi long can you eat of the cauliflower shells? 3 days, 4 days??? I had them in my fridge for 5 days. Thank you for using “weight” measurements!!! I know a lot of work goes into the recipes that everyone is so kind to share, but 2 people can pick up a “medium ” head if cauliflower and it could be quite a different weight!!! Can’t wait to try these!!! I made these tonight. I didn’t have Mexican cheese but I wanted to use Parmesan cheese instead. I followed the recipe but used 1 cup parmesan cheese and 1.25 cups of Pepper Jack cheese. I added 1/4 tsp black pepper. They turned out super yummy! My husband who doesn’t like cauliflower even liked them and he knew they were cauliflower shells! 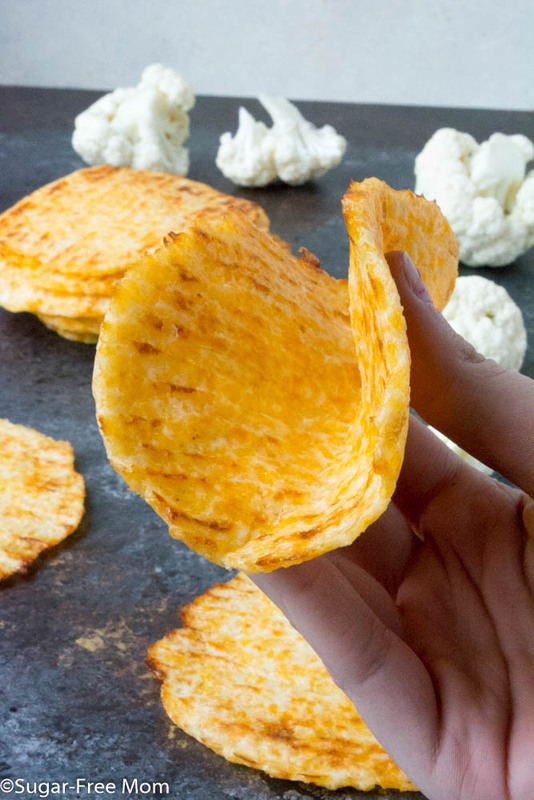 These would be awesome as a pizza crust, or taco shell, or served with homemade hummus, or eat them plain like I did! Thanks for sharing your recipe. I love the fact that you don’t have to cook the cauliflower first. These are so easy!